The RUC was superseded by the Police Service of Northern Ireland (PSNI) in 2001. The former police force was renamed and reformed, as is provided for by the final version of the Police (Northern Ireland) Act 2000. The RUC has been accused by republicans and Irish nationalists of one-sided policing and discrimination, as well as collusion with loyalist paramilitaries. Conversely, it was praised as one of the most professional policing operations in the world by British security forces. The allegations regarding collusion prompted several inquiries, the most recent of which was published by Police Ombudsman Nuala O'Loan. The report identified police, CID and Special Branch collusion with loyalist terrorists under 31 separate headings, in her report on the murder of Raymond McCord and other matters, but no member of the RUC has been charged or convicted of any criminal acts as a result of these inquiries. Ombudsman Dame Nuala O'Loan stated in her conclusions that there was no reason to believe the findings of the investigation were isolated incidents. An interim report was published on 28 March 1922, the first official report of the new Parliament of Northern Ireland, and it was subsequently accepted by the Northern Ireland Government. On 29 April 1922, King George V granted to the force the name Royal Ulster Constabulary (RUC). :13 In May, the Parliament of Northern Ireland passed the Constabulary Act 1922 and the RUC officially came into existence on 1 June. The headquarters of the force was established at Atlantic Buildings, Waring Street, in Belfast. 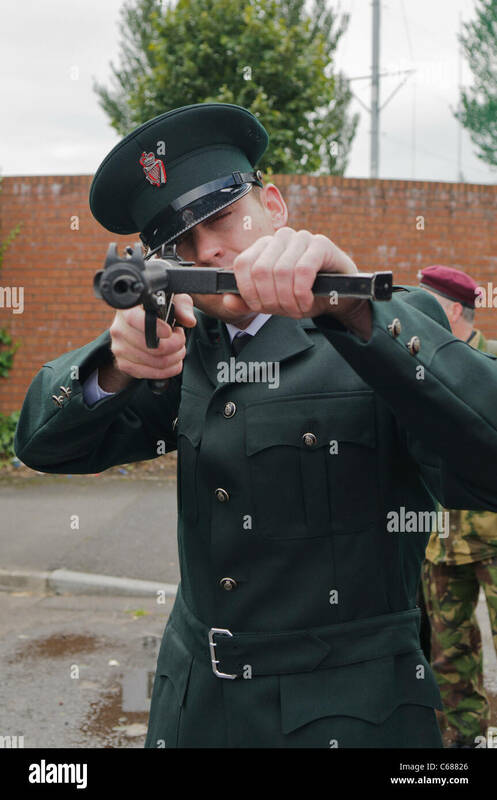 The uniform remained essentially the same as that of the RIC - a dark green, as opposed to the dark blue worn by the other British police forces and the Garda Síochána. A new badge of the Red Hand of Ulster on a St George's Cross surrounded by a chain was designed but proved unpopular and was never uniformly adopted. Eventually the harp and crown insignia of the Order of St Patrick, as worn by the RIC, was adopted. 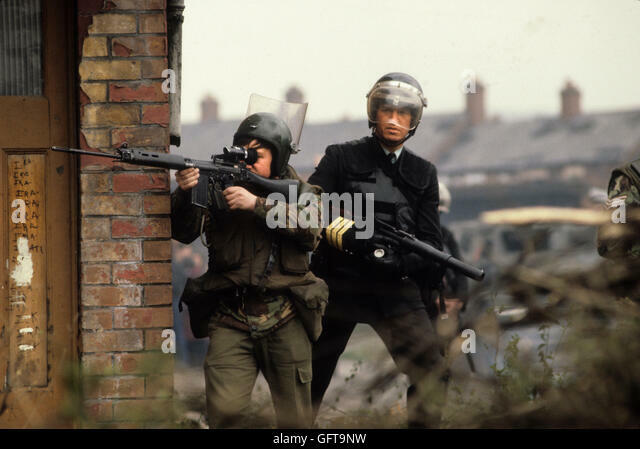 From the beginning it had a dual role, unique among British police forces, of providing a normal law enforcement police service while enforcing the new Northern Ireland entity in the face of considerable opposition, both armed and unarmed. :13 To this end, its members were armed, as the RIC had been. The RUC was limited by statute to a 3,000-strong force. :268 Initially, a third of positions within the force were reserved for Roman Catholics, a reflection of the denominational proportions of the population of Northern Ireland at that time. The first two thousand places were filled quickly and those reserved for Catholics were filled mainly by ex-RIC men fleeing north. Due to reluctance by the political establishment to employ too many Catholics (who were seen as potentially disloyal to the Protestant and unionist ethos of the new government), the force abandoned this policy. As a result, representation of Catholics in the RUC never exceeded 20%. In addition, many Roman Catholics who joined the force, particularly during the troubles were targeted for murder or ostracised by their own community. By the 1960s, representation of Catholics in the RUC had fallen to 12%. About 90 police officers were killed between 1920 and 1922 in what would become Northern Ireland. The security forces were implicated, but no convictions ever rendered, in reprisal killings of Catholics, notably the McMahon killings on 26 March 1922 in which six Catholics were killed, and the Arnon Street killings, several days later on 1 April 1922, in which six more Catholics were shot dead in retaliation for the IRA killing of a policeman. By the mid-1920s the situation had calmed down. For the next forty-five years the murder rate was lower than in the rest of the UK and the crime detection rate was higher. The 1920s and 1930s were years of economic austerity. Many of Northern Ireland's traditional industries, notably linen and shipbuilding, were in recession. This contributed to the already high level of unemployment. Serious rioting broke out in 1932 in Belfast in protest at the inadequate nature and level of relief for the unemployed and the threat of rioting was ever present. In response to the growth of motorised transport the RUC Traffic Branch was formed on 1 January 1930. In 1936 the police depot at Enniskillen was formally opened and an £800,000 scheme to create a network of 196 police barracks throughout Northern Ireland by rationalizing or repairing the 224 premises inherited from the RIC was under way. :22 In May 1937 a new white glass lamp with the RUC crest went up for the first time to replace the RIC crest still on many stations. About the same time the Criminal Investigation Department (CID) in Belfast was significantly expanded, with a detective head constable being appointed to head the CID force in each of the five Belfast police districts. There was sporadic Irish Republican Army activity in the 1930s. The RUC was a "reserved occupation", i.e. the police force was deemed essential to the war effort on the Home Front and its members were forbidden to leave to join the other services. The wartime situation gave a new urgency to the discussions regarding the appointment of women police. The Ministry of Home Affairs finally gave approval to the enrolment of women as members of the RUC on 16 April 1943. with the first six recruits starting on 15 November. Post-war policies brought about a gradual improvement in the lot of the RUC, interrupted only by a return to hostilities by the IRA border campaign from 1957 to 1962, in which seven RUC officers were killed. The force was streamlined in the 1960s, a new headquarters was opened at Knock, Belfast and a number of rural barracks were closed. In 1967, the 42-hour work week was introduced. The civil rights protests during the 1960s, and the reaction to them, marked the beginning of the conflict that became known as "the Troubles". The RUC found itself confronting marchers protesting against gerrymandering of local electoral wards and discrimination in local housing allocation. Many of these Northern Ireland Civil Rights Association protests were banned or truncated by the government of Northern Ireland. The Ulster Special Constabulary were controversial, with the unit seen by some nationalists as more anti-Catholic and anti-nationalist than the RUC, which, unlike the B Specials, did attract some Catholic recruits. The severe pressure on the RUC and the perceived partiality of the B-Specials led, during the Northern Ireland riots of August 1969, to the British Army being called in to support the civil administration under Operation Banner. Catholics largely turned away from the British Army, who they saw as treating Protestants differently, especially after the Falls Curfew. The high level of civil unrest led to an exhaustive inquiry into the disturbances in Northern Ireland carried out by Lord Scarman, which produced a report in 1972. James Callaghan, Home Secretary in 1969, called on Brigadier Henry Cecil John Hunt (Lord Hunt) to assess, advise and report on the policing situation. He was assisted in this task by Sir Robert Mark, who later became Commissioner of the Metropolitan Police Service, and Sir James Robertson, then-Chief Constable of Glasgow. The Hunt Report was published on 3 October 1969, and most of its recommendations were subsequently accepted and implemented. The aim was to completely reorganise the RUC, both modernizing the force and bringing it into line with the other police forces in the UK. This meant the introduction of the British rank and promotion structure, the creation of 12 Police Divisions and 39 Sub-Divisions, the disbandment of the Ulster Special Constabulary, and the creation of a Police Authority designed to be representative of all segments of the community. Callaghan, later elected Prime Minister, asked Sir Arthur Young, Commissioner of the City of London Police, to be seconded for a year. Young's appointment began the long process of turning the RUC into a British police service. The RUC Reserve was formed as an auxiliary police force, and all military-style duties were handed over to the newly formed Ulster Defence Regiment, which was under military command and replaced the B Specials. Callaghan selected Young, a career policeman, because no other British policeman could match his direct experience of policing acutely unstable societies and of reforming gendarmeries. from 1943 to 1945, he was Director of Public Safety and Director of Security in the military government of Allied-occupied Italy. Later, he had been seconded to the Federation of Malaya at the height of the Malayan Emergency (1952–53) and to the crown colony of Kenya during Mau Mau (1954). Policing Northern Ireland's divided society proved to be difficult, as each of the main religious blocs (Protestant and Roman Catholic) had different attitudes towards the institutions of the state. To most Ulster Protestants, the state had full legitimacy, as did its institutions, its parliament, its police force and the Crown. 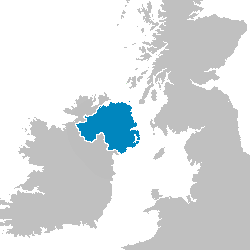 Many of Northern Ireland's Catholics, along with their political leaders, believed that partition would only be temporary. Many abstained from and/or refused to take part Northern Ireland's institutions for a variety of reasons, including the treatment of Catholic civilians by the Ulster Special Constabulary during the recent conflict and the mistaken belief that Northern Ireland would be ceded to the Free State in the not too distant future. Protestant fears of strategically important government services being infiltrated by Catholics disloyal to the new state polarised society and made most Catholics unwilling and/or unable to join either the police or the civil service. In a report released on 22 January 2007, the Police Ombudsman Dame Nuala O'Loan stated Ulster Volunteer Force (UVF) informers committed serious crimes, including murder, with the full knowledge of their handlers. The report stated that RUC Special Branch officers created false statements, blocked evidence searches and "baby-sat" suspects during interviews. ^ Number of RUC killed during the Troubles, cain.ulst.ac.uk; accessed 22 December 2014. ^ Study of the RUC, bjc.oxfordjournals.org; accessed 21 February 2014. ^ "Northern Ireland - Identity Crisis for Police". CNN. Archived from the original on 29 August 2007. ^ Number of people killed by RUC in Northern Ireland, cain.ulst.ac.uk; accessed 22 December 2014. ^ , 15 murders linked to police collusion with loyalists. ^ , There was collusion between some police officers and loyalist gunmen who killed six Catholics 22 years ago, a report by NI's Police Ombudsman has said. ^ "The RUC: Lauded and condemned". BBC News. bbc.co.uk. 31 October 2001. Retrieved 5 June 2007. 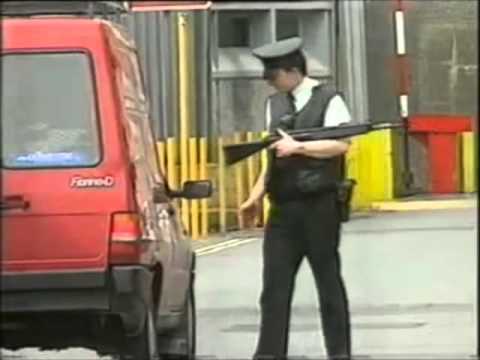 Condemned by republicans, nationalists and human rights groups for embodying sectarianism and lauded by British security forces as one of the most professional police operations in the world, the Royal Ulster Constabulary is one of the most controversial police forces in the UK. ^ Synopsis of report by Ombudsman Nuala O'Loan, BBC.co.uk; accessed 19 September 2014. ^ a b c d e f Ellison, Graham; Smyth, Jim (20 May 2000). The Crowned Harp: Policing Northern Ireland. Pluto Press. p. 19. ISBN 9780745313931 – via Google Books. ^ a b Morrison, John (1993). "The Ulster Government and Internal Opposition". The Ulster Cover-Up (Paperback). Lurgan, County Armagh: Ulster Society (Publications) Ltd. pp. 26, 39–40. ISBN 1-872076-15-7. ^ Lynch, Robert John (1 February 2006). The Northern IRA and the Early Years of Partition, 1920-1922. Irish Academic Press. p. 122–123. ISBN 9780716533771 – via Google Books. ^ Parkinson, Alan F. (17 June 2008). Belfast's Unholy War: The Troubles of the 1920s. Four Courts Press. ISBN 9781851827923 – via Google Books. ^ Mitchell, Seán (15 June 2017). "Struggle or Starve: Working-Class Unity in Belfast's 1932 Outdoor Relief Riots". Haymarket Books – via Google Books. ^ Barton, Brian (9 September 1995). Northern Ireland in the Second World War. Ulster Historical Foundation – via Google Books. ^ Cochrane, Feargal (2013). Northern Ireland: The Reluctant Peace. Yale University Press. p. 57. ^ Smith, William (2011). The British State and the Northern Ireland Crisis, 1969–73: From Violence to Power-sharing. US Institute of Peace Press. p. 151. ^ "Scarman Report on violence and civil disturbances in Northern Ireland in 1969". discovery.nationalarchives.gov.uk. The National Archives. 4 April 1972. ^ "1969: Ulster's B Specials to be disbanded". On This Day-10 October. BBC. Retrieved 12 March 2014. ^ Hunt Report–Summary Of Recommendations: (2) "There should be a Police Authority for Northern Ireland, whose membership should reflect the proportions of different groups in the community (paragraphs 87,88)." ^ a b McKittrick, David; Kelters, Seamus; Feeney, Brian; Thornton, Chris (2008). Lost Lives: The Stories of the Men, Women and Children who died as a result of the Northern Ireland Troubles. Edinburgh: Mainstream Publishing. p. 32. ISBN 978-1-84018-504-1. Retrieved 25 February 2015 – via books.google.com.au. ^ Sutton, Malcolm. "14 July 1969 (re Francis McCloskey)". An Index of Deaths from the Conflict in Ireland. Conflict Archive on the Internet. Retrieved 21 February 2014. ^ Sutton, Malcolm. "Friday 2 May 1986". A Chronology of the Conflict. Conflict Archive on the Internet. Retrieved 25 February 2014. ^ Bartlett, Thomas. Ireland, A History. Cambridge University Press. p. 425. ISBN 978-1-107-42234-6. ^ Connolly, S.J. Oxford Companion to Irish History. Oxford University Press. p. 410quote=Returned to the first House of Commons in 1921 were 40 Unionists, 6 Nationalists, and 6 Sinn Feiners ... No nationalist member took their seats prior to 1925, and organised nationalist abstention occurred frequently between 1932 and 1945. ISBN 978-0-19-923483-7. ^ Bardon, Jonathan. A History of Ulster. The Blackstaff Press. pp. 500–1. ISBN 0-85640-764-X. Except in Irvinestown and Ballycastle, Nationalists and Sinn Fein refused to meet the Leech commission. The result was that local Unionist parties, with the enthusiastic co-operation of Dawson Bates, were able to dictate the positioning of boundaries with meticulous care to their own complete satisfaction. The results speak for themselves. Since many Catholics abstained in 1924, the best comparison is between the local election results of 1920 and 1927 ... Unionists countered criticism by pointing to the failure of Nationalists and Sinn Fein to make submissions to the Leech commission. Certainly by refusing to take their seats in the Northern Ireland parliament, Nationalists and Sinn Fein not only reinforced the Unionist view that they were intent on bringing down the state but also denied themselves a wider audience and a chance to obtain some redress from Westminster. ^ Trimble, David (10 December 1998). "Nobel Peace Prize 1998 – Nobel Lecture, Oslo". nobelprize.org. Retrieved 20 February 2014. ^ a b Farrell, Michael (1992). Northern Ireland: The Orange State. Pluto Press. pp. 54, 96, 97. ISBN 0-86104-300-6 – via books.google.com.au. ^ Northern Ireland. Parliament. House of Commons. Parliamentary Debates (Hansard) House of Commons Official Report. 72. H.M. Stationery Office, 1969. p. 926 – via books.google.com.au. ^ Edwards, Ruth Dudley (13 November 2005). "The twists and turns on the road to one rule of law". Sunday Independent. Retrieved 25 February 2015 – via ruthdudleyedwards.co.uk. ^ Discrimination survey; serve.com; accessed 19 February 2014. ^ Sutton, Malcolm. "CAIN: Sutton Index of Deaths". ^ policememorial.org.uk; accessed 21 February 2014. ^ Smithwick: Collusion in Bob Buchanan and Harry Breen murders, BBC.co.uk; 3 December 2013; accessed 21 February 2014. ^ CAIN profile of RUC Officer Francis O'Reilly, cain.ulst.ac.uk; accessed 20 February 2014. ^ Children in Northern Ireland: Abused by Security Forces and Paramilitaries, Human Rights Watch Helsinki, hrw.org; accessed 21 February 2014. ^ Children in Northern Ireland, Human Rights Watch; 1 July 1992; accessed 21 February 2014. ^ Center for Civil & Human Rights, www.nd.edu; accessed 20 February 2014. ^ Overview and Recommendations document for Stevens 3 is available in PDF format here. ^ Statement by the Police Ombudsman for Northern Ireland on her investigations into the circumstances surrounding the death of Raymond McCord, Jr. and related matters, bbc.co.uk, 22 January 2007; accessed 22 December 2014. ^ RUC awards, royalulsterconstabulary.org; accessed 21 February 2014. ^ Queen honours NI police, BBC.co.uk; accessed 21 February 2014. ^ RUC uniform insignia history, uniforminsignia.net; accessed 21 February 2014. ^ "Deactivated RARE Royal UlsterConstabulary (RUC) Issued Webley MK6 .455 Revolver. - Allied Deactivated Guns - Deactivated Guns".